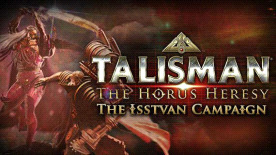 The Isstvan Campaign expansion allows you to explore the events of The Horus Heresy around the Isstvan System in more detail and play as the Warlords and Legions that fought there. The expansion includes 6 new Warlords for you to play and each one comes with their custom Legion Dataslates. Fulgrim, the Phoenician, Prefector of Chemos and High Lord of the Emperor's Children. Perturabo, The Lord of Iron, Primarch of the Iron Warriors - a grim warrior and a master of technological arcarna. Ferrus Manus, the Gorgon, Master of the Iron Hands. Nathaniel Garro, Hand of the Sigillite, former Battle-Captain of the Death Guard 7th Battle Company. Saul Tarvitz, One of the few loyalist Company Captains of the Emperor's Children Legion. Both Loyalist and Traitor may also play as a Chaplain, an Inspiring leader of any of the 18 Legions. Each Warlord also comes with their custom Legion Dataslates. The Campaign also includes new Stratagems, Places, Strangers and Events for you to explore, plus the entire Isstvan region.